Culling will not stop the spread of a deadly fungus that is threatening to wipe out hibernating bats in North America, according to a new mathematical model. 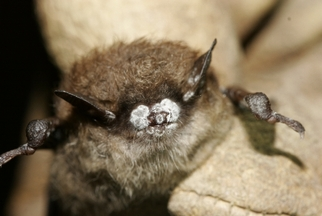 White-nose syndrome, which is estimated to have killed more than a million bats in a three year period, is probably caused by a newly discovered cold-adapted fungus, Geomyces destructans. The new model examines how WNS is passed from bat to bat and concludes that culling would not work because of the complexity of bat life history and because the fungal pathogen occurs in the caves and mines where the bats live. "Because the disease is highly virulent, our model results support the hypothesis that transmission occurs in all contact areas," write the paper's authors, Tom Hallam and Gary McCracken, both of the University of Tennessee. "Our simulations indicated culling will not control WNS in bats primarily because contact rates are high among colonial bats, contact occurs in multiple arenas, and periodic movement between arenas occurs." Ground work on the model was initiated in a 2009 modeling workshop on white-nose syndrome held at the National Institute for Mathematical and Biological Synthesis (NIMBioS) in Knoxville, Tennessee. At the interdisciplinary workshop, experts in the fields of bat physiology, fungal ecology, ecotoxicology, and epidemiology discussed ways in which mathematical modeling could be applied to predict and control the spread of WNS. "NIMBioS' support for the workshop that initiated this project was crucial in helping formulate models that could be useful in looking at white-nose syndrome," Hallam said. Culling of bats in areas where the disease is present is one of several options that have been considered by state and federal agencies as a way to control the disease. However, a review of management options for controlling WNS in the paper indicates that culling is ineffective for disease control in wild animals and in some cases, can exacerbate the spread. White-nose syndrome first appeared in a cave in upstate New York in 2006, and has since spread to 14 states and as far north as Canada. Regional extinctions of the most common bat species, the little brown bat, are predicted within two decades due to WNS. Eating up to two-thirds of their body weight in insects every night, bats help suppress insect populations, ultimately reducing crop damage and the quantities of insecticides used on crops. Bats also play an important ecological role in plant pollination and seed dissemination. Citation: Hallam TG, McCracken GF. 2011. Management of the panzootic white-nose syndrome through culling of bats. Conservation Biology 25(1): 189-194.